Dylan Groenewegen of Team LottoNL Jumbo celebrates after winning the stage seven of Tour de France. 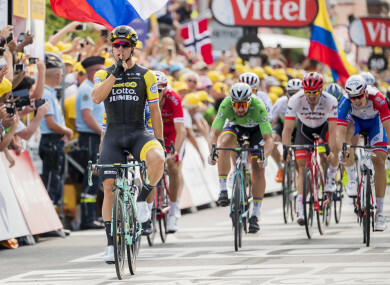 DUTCHMAN DYLAN GROENEWEGEN burst past Colombian sprinter Fernando Gaviria to seal a first win on this Tour de France on Friday, saying he’d refound his confidence, speed and pride at the end of a 231km seventh stage from Fougeres to Chartres. “People had been saying I was not good enough to win a stage on this Tour, so I put my finger to my lips to tell them to shut up,” said Groenewegen, explaining his gesture at the finish line. Groenewegen grew up in a cycling environment as his grandfather was a bike manufacturer and his boyhood coach was Jean-Paul van Poppel, winner of nine sprint finishes at the Tour de France. “I was pretty disappointing in the first few stages but now I’ve got the power back in my legs,” said the 25-year-old from Amsterdam who dislikes comparisons to Briton Mark Cavendish. “I have my own style,” he said when asked about his similarity to the veteran Manxman with 39 stage wins under his belt. “This win was fantastic for my self confidence, I feel under less pressure now, a sprinter needs confidence. World champion road racer Sagan said he’d been happy enough to stay on Gaviria’s wheel and keep ahead in the green points jersey race. He has 234 points to the 23-year-old Gaviria’s 203. “I had a good day,” said the Slovak, who has, like Gaviria, two stage wins so far. “It was a boring stage, no wind, no stress just boring, I was talking to everybody,” he said. Belgian Greg Van Avermaet retained the leader’s yellow jersey ahead of Saturday’s eighth stage and said he hope to go to the mountains with it next week after what he described as a relaxing day. “It was nice to relax because over this first week we have had very little chance to do that, believe me,” said the BMC man. “If tomorrow is like that and all goes well on the cobbles on Sunday, it would be great to go into the rest day with the yellow,” said Van Avermaet, who will be helping GC contender Richie Porte to keep out of trouble on the Roubaix stage. Van Avermaet actually extended his lead in the overall standings over Geraint Thomas to six seconds when he raced ahead of the pack to win a three-second bonus sprint. BMC captain Porte is 56sec off the lead, Adam Yates 1min 05sec, defending champion Chris Froome at 1min 06sec, with Thursday’s stage winer Dan Martin at 1min 30. With a notoriously difficult 90 degree bend with 2km to go and speeds hitting 60 km/h, tensions were high over the closing kilometres as the sprinters’ teams jockeyed for position. But the peloton slowed and hostilities began with a ‘faux plat’ incline to the final 150m, with Sagan’s Bora, Gaviria’s Quick-Step and the winner’s Lotto outfit prominent into the final stretch. Around 95km from Chartres the peloton split in a cross wind, trapping Irishman Martin (Team Emirates) in the second group. He was swift to react, leading his team across the breach within a couple of kilometres. The lone survivor of a long-range breakaway, Yoann Offredo (Wanty), was reeled in with 38km remaining, alerting a nervous peloton to further breaches caused by crosswinds on the open plains. Email “Groenewegen's show of power silences Tour de France critics, Dan Martin 1 minute 30 off the lead”. Feedback on “Groenewegen's show of power silences Tour de France critics, Dan Martin 1 minute 30 off the lead”.